The Vision fire started on October 3, 1995, and burned until the 16th. 12, 354 acres burned, including 45 homes in the community of Inverness, along with three outbuildings. Thankfully, no lives were lost and there were no major injuries. Suppression resources and fire crews came from around the state, at a final cost of $6.2 million dollars. Full story coming. 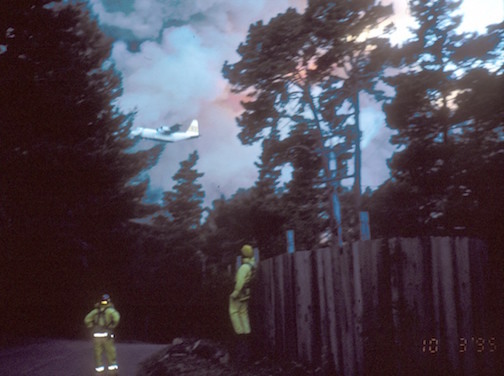 An air tanker makes a drop at the Vision Fire on October 3, 1995. Photo courtesy Marin County FD. 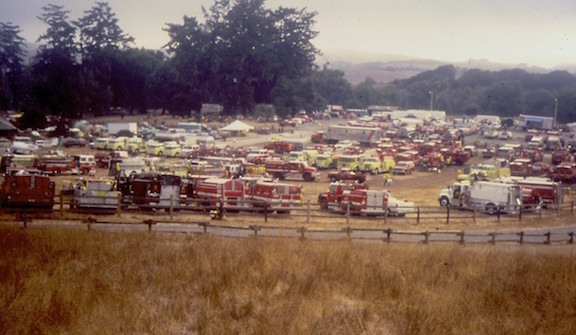 Photo of the Fire Camp area at Bear Valley, courtesy crew of Skywalker Ranch Fire Brigade Engine 461.